The Finger Lakes is going to continue experiencing the rollercoaster ride of temperatures over the next several days. Some rain is possible late-Wednesday, into early-Thursday. However, the chance of rain will be a welcomed sight as the region has been mostly-dry over the last several weeks. 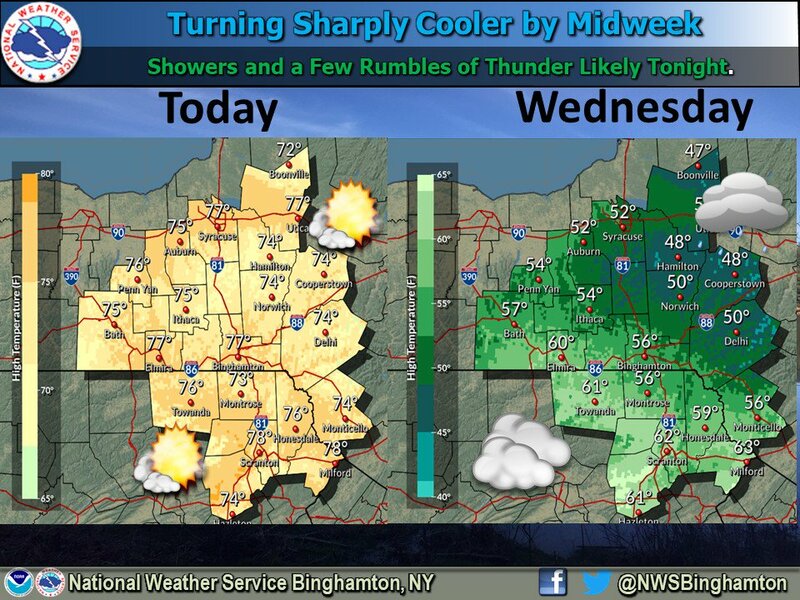 FLX Weather Meteorologist Drew Montreuil says that showers and a few embedded thunderstorms will drop southeast into the Finger Lakes from Canada this afternoon after 4 pm. He says the best chance for rain will be across the western and northern parts of the region. After sunset, the rain will continue to spread southeast. Areas west of I-390 and north of I-90 stand the best chance at seeing localized amounts of a half-inch or more. Most areas will see closer to a quarter-inch of rain, according to Montreal. Partly sunny, then gradually becoming sunny, with a high near 72. Light west wind increasing to 5 to 10 mph in the morning. A slight chance of showers after 2am. Increasing clouds, with a low around 53. West wind 5 to 7 mph. Chance of precipitation is 20%. A chance of showers, mainly after 8am. Mostly cloudy, with a high near 68. West wind around 5 mph becoming calm in the afternoon. Chance of precipitation is 40%. New precipitation amounts between a tenth and quarter of an inch possible. A chance of showers. Mostly cloudy, with a low around 55. Chance of precipitation is 30%. New precipitation amounts of less than a tenth of an inch possible. A chance of showers. Mostly cloudy, with a low around 63. Breezy. Chance of precipitation is 40%. Visit the FingerLakes1.com Weather Center for the latest weather from around the Finger Lakes, as well as the latest forecast from the National Weather Service.